Nestled at the southern tip of the Korean Peninsula Tongyeong (統營) is a treasured and historically meaningful place for Koreans. In addition, the seaside port city is beautiful and the food is delicious there. If you can, take a holiday and visit its nearby secluded islands. Tongyeong has some 70 islands including 60 uninhabited ones. According to Mr. Kenny Kang (姜奎祥), manager of the Korean Tourism Organization (KNTO)'s Yeongnam Branch, Tongyeong is known as the "Oriental Naples" with its spectacular beauty. Most of its pristine islands are still intact from the human touch. During the Jeoseon Dynasty, there were Japanese invasions of Korea (1592-1598). A navy, with Admiral Yi Sun-Sin (李舜臣) as commander, was formed to protect the southern provinces of Jeolla, Gyeongsang, and Chungcheong. 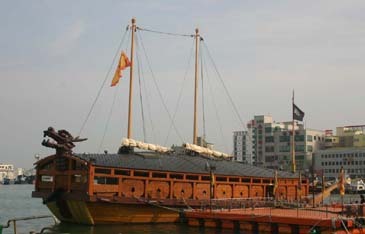 The replica of Geobukseon or turtle ship anchored at the port city of Tongyeong, South Gyeongsang Province, South Korea. Totally outnumbered by Toyotomi Hideyoshi's massive armada, Admiral Yi saved the Jeoseon Dynasty's Korea, making himself "immortal" hero. Originally called Hansando (閑山島) or Hansan Island, the place was where Admiral Yi's naval headquarters of the three provinces was located. Its name was changed into Tongyeong which was the name of his headquarters. From this time on, the island was called "Tongyeong." On July 8, 1592 in Admiral's Yi's Great Hansan Island Battle (閑山島大捷), some 70 of the 100-plus Japanese warships were destroyed and entire Japanese navy was paralyzed. This is one of the four greatest naval battles in the world. The world's first iron-clad "turtle ships," invented by Admiral Yi, were very useful in the battle. At a height of 461 meters, Mt. Mireuk or Maitreya in Sanskrit, is one of the 100 best-known mountains in the nation. Recently installed, the fantastic gondola machine is the longest cable line in South Korea at 1,975 meters. There are 48 cable cars, and a maximum of eight people are allowed per car. The panoramic view includes a group of islands, the harbor of Tongyeong, the two Buddhist temples of Yonghwasa and Miraesa, and finally the place of Admiral Yi's Hansan Island battle, the top of Mt. Maitreya. 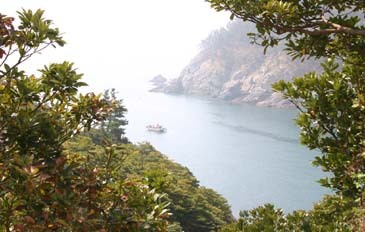 One of the inhabited islands scattered around the port city is Yokjido or Yokji Island about a 40-minute ferry ride from the port. It is located 32 kilometers from the port. 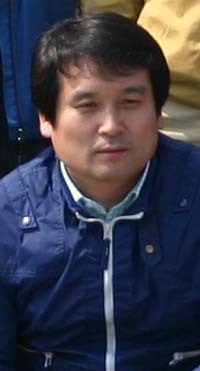 President Kim Young-Woon of Sanbada Tour Co. led scores of local travel writers and other tour specialists to Toyeong's Yokjido islet on April 14-15, 2008. Sanbada Tour is one of the fastest growing tour conductors in South Korea. 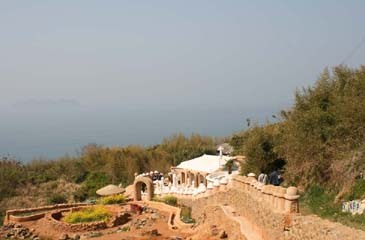 Sanbada organizes domestic group tours frequently. The gross area is 24 square kilometers. Its wild wind, waves, and sharp cliffs are unforgettable. In ancient times, the island was mysterious and people were curious, therefore the island is called: Yok meaning "desire" and Ji meaning "knowledge." Formerly abandoned, it was only during the Japanese occupation of Korea (1910-45) that people started to live there. Still, you can find traditional Japanese houses and pubs. Yokjido consists of 27 uninhabited and 12 populated islands. Of all the islands, "Turtle" is the most famous. When you look out onto the water, you may see strange-looking circles and spires; these are for fishing, in Korean it is called Ga Doo Ri. There are two different types: one used for mackerels and another for red snappers. Mackerels go bad quickly after dying, so they cannot be taken far to urban cities. Unfortunately, these days most fishermen cannot make much money. Red tide, typhoon, and cheap Chinese seafood are possible reasons for this. The local specialties are aralia and sweet potatoes. The sweet potatoes produced on the island are sold at prices twice as high than normal ones. Yokji has nine distinct views of which the first and sixth are the best. Most famous of them are the first view and the sixth view. The first view is from Sam-Ryo observation post where every New Year's Day over 10,000 people come to celebrate under the Year 2000 Millennium Monument. Another, the sixth view, at a height of 465 meters, is Cheon-Wang Peak, which gives people an aerial view of the scenic Yokji islet. On this islet is a special place for people, particularly for the believers of Jesus Christ. Dubbed "The New Garden of Eden," this interesting place was built on the edge of Yokji by a mother whose daughter's stomach cancer was completely healed by the grace of God, according to the mother Ms. Choi Suk-Ja. Their small house and the surrounding statues and other ornaments were all made out of earth by the 60-year-old woman in the hope of healing her daughter's cancer. She said that she brought her daughter to this remote and abandoned place in her last hope of curing her seemingly incurable cancer a decade ago. Years of their hard life, like that of Robinson Crusoe, and earnist prayer day and night brought them a miracle. The daughter's cancer was gone and the mother believes it was cured through the power of prayer. This story was spread quickly all around the nation and now it is the most popular tourist attraction in Tongyeong. 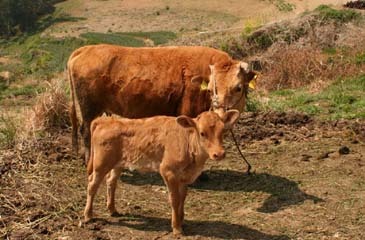 A Korean cow and her baby attract the attention of travelers on Tongyeong's Yokji islet. Among the 2,000-plus islet residents are farmers and fishermen since it is still unknown to the urbanites. 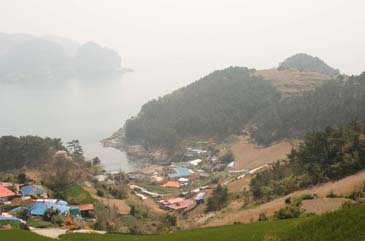 Between Tongyeong and the island of Yokji is the islet of Yeonhwa. Yeonhwa means lotus flower. 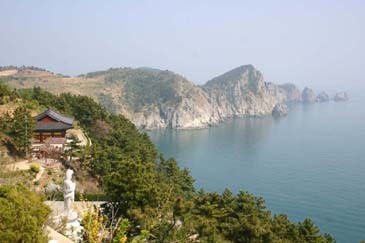 There is a small Buddhist temple "Yeonhwasa Temple" on the cliff on the island. The local legend says the temple was build by a Buddhist monk named by Yeonhwa. He earned his respect from the villagers for his behavior and for his devotion to Buddhism. When the monk died everybody was so sad. They burried him at sea and a beautiful lotus flower rose from the water. Villagers started to call their islet Yeonhwado or the island of lotus flower. And in actuality, the islet is shaped like a lotus flower.